Sussex Green Living with the help of Horsham Quakers and local residents launched a third recycling collection point in Horsham, last Saturday (7th Dec) at their monthly Green Coffee Morning and Mini Market. This scheme will enable the people of Horsham to divert specific landfill waste resources into a recycling scheme financially benefiting the William Penn Primary School in Coolham. This is fantastic green community collaboration between the Horsham Quakers and the William Penn School which is a unique primary school with a Quaker foundation. The William Penn recycling scheme was launched a year ago by Carrie Cort, director of Horsham based Take One Productions and founder of their CSR initiative Sussex Green Living. Carrie reports “This recycling scheme has enabled us to deliver an ongoing environmental communications campaign with parents, children and staff and provide a financial incentive”. She continues “I believe that every school with Eco School status should have to run such a recycling scheme, it’s a win win for the schools and the environment”. To date the recycled waste resources have generated about £150 for the school. Recently they entered a UK wide biscuit wrapper recycling competition, with the help of the local community they collected 1,301 biscuit wrappers generating £62.06 and came 13th in the country. 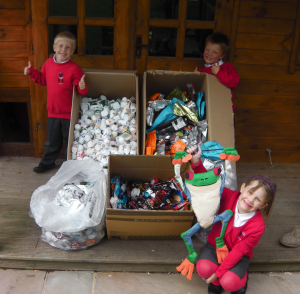 The Quakers and the William Penn School ask the people of Horsham and surrounding villages to help divert these materials from landfill. People can collected any brand of non-savoury biscuit wrappers, toothpaste tubes and toothbrushes, fruit and vegetable pouches for babies, baby wipe packaging, eco refill coffee packaging, fresh coffee bean packaging, plastic coffee lids, plastic milk bottle lids (2 and 4 only), ballpoint pens, felt tip pens, propelling pens, correction fluid, marker and highlighter pens. They are also able to collect Tassimo plastic pots and outer foil packaging for coffee, tea and chocolate drinks (not other brands) and Activia, Actimel and Shape yoghurt pots and bottles (not other brands). People should drop off their recycling at their nearest collection points, these are: William Penn Primary School in Coolham or the Quaker Meeting House, Worthing Road, Horsham (opposite Sainsbury’s car park) in the branded bin to the right of the Friends Cottage front door. Sussex Green Living have another public collection point for coffee packaging only which is at and financially benefits Horsham Matters, Tanfield Garage, Guildford Road, Horsham, RH12 1TR. This community recycling scheme fits well with the William Penn School and Quakers ideals and values, which are working locally and globally for social justice and through supporting peacemakers and caring for the environment. 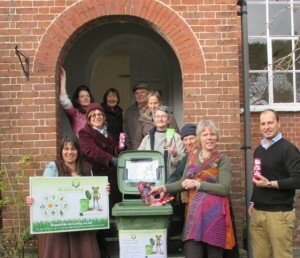 Helen Whittington from the Horsham Quakers closed by saying “We are delighted to be able to offer the people of Horsham this recycling collection point in central Horsham”. She continued “We are passionate about helping the environment and believe if we take steps at a local and national level, we will start to make progress on a global scale”. This Green Coffee morning and mini market is hosted by Horsham Quakers every first Saturday of month 10am – 12. Regularly attractions including Ecover cleaning product refilling service run by Horsham Transition Town. Bring your bottles to refill and get a range of Ecover cleaning products at trade price. More information about this event can be found here - horshamquakermeeting@phonecoop.coop. 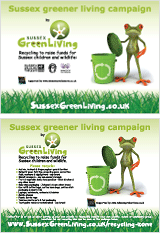 More information about the Sussex Greener Living Campaign can be found here http://www.sussexgreenliving.co.uk/recycling-zone/recycling-for-charity/#2. This entry was posted in Eco School Sussex blogs, Eco School William Penn, Events, Green stats, facts & news. Bookmark the permalink.